Cook the pasta as you usually do. Set aside. Chop the garlic and cut the pepper into strips. Add the olive oil to a saucepan and sauté the garlic, pepper, cilantro and the corn. Cover with milk and season with salt to taste. Let it thicken until it boils and then blend the mixture. Pour over the pasta and serve immediately. 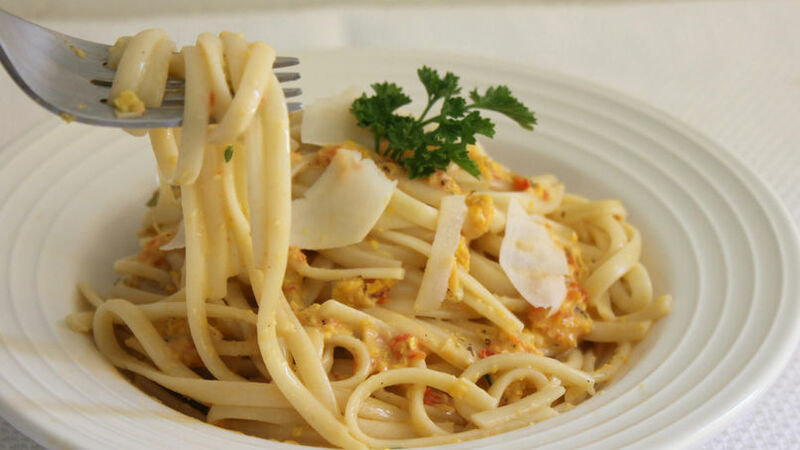 You can use fettuccini, shells, macaroni or any other type of pasta you like. If you like your food spicy you can add a little bit of habanero pepper or hot sauce before blending the mixture. Pasta is a dish that we all love eating and preparing. The reasons behind this are very important: it’s economical, easily stored, cooked in just a few minutes and can be combined with many different flavors. The recipe I am sharing with you today is one that could easily become a classic in your kitchen. Preparing a sauce with corn and a few spices helps you create a delicious treat you’ll want to repeat time and time again. Serve this spaghetti with a side salad or bread to soak up the sauce. Always be sure to have a box of pasta in your pantry and surprise your family or guests with an easy recipe.